Protesters say the giant buses, which carry employees of tech companies such as Google, Facebook and Apple, drive up housing prices. Activists blocked tech buses in San Francisco, near Valencia and Cesar Chavez streets, Tuesday morning, Feb. 8, 2016. Activists formed a blockade Tuesday morning to protest the tech buses that shuttle thousands of workers between San Francisco and Silicon Valley. Demonstrators showed up about 8:45 a.m. at the bus stop at the intersection of Cesar Chavez and Valencia streets. They argue that the Municipal Transportation Agency program permitting tech companies such as Google, Apple and Facebook to use Muni stops is causing a spike in housing prices in areas around the stops. Critics also believe the program should be subject to a full environmental review, though most data show the buses are cleaner than the hundreds of cars they replace. The protest was carefully timed. The San Francisco Board of Supervisors was scheduled to vote on the program’s future Tuesday morning. KQED reports a deal between three supes and tech shuttle operators would allow the tech buses to keep using the Muni stops for another year while the city studies the program’s impact. The supes will take the issue up again Feb. 23. 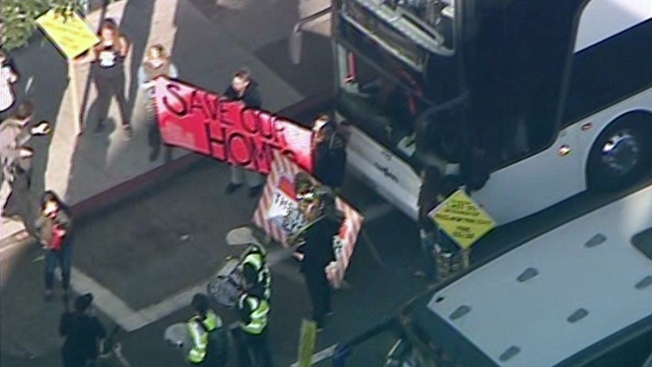 According to protest organizers, Tuesday’s protest marked the 26-month anniversary of the first time activists attempted to block a tech bus in order to bring attention to housing and inequality issues in San Francisco.